I know I promised the second half of my series on who own's black history to you all last week. And I do still promise it to you. But time slipped through my fingers this week, and I would rather devote a few more hours to ruminating on the next installment than to go off half cocked. A Paper in the Army. By S. V. Co. E. 2D Regt. Tune- "Wait for the Wagon." "The Union" is our watchword where'er our footsteps roam. And we will plant it North and South on plain or mountain crag. And we'll all take a ride. Our fathers fought the mother when she raised the tyrant hand. And we will whip the brother who wo'd scourge our happy land. CHORUS- Then wait for the Union, &c.
Our wagons are "substantial," and our horses large and full. And when they get into the battle they will "put the rebels through." Our cause is just and holy, our laws "must be preserved." So jump into the Union and we'll all take a ride. 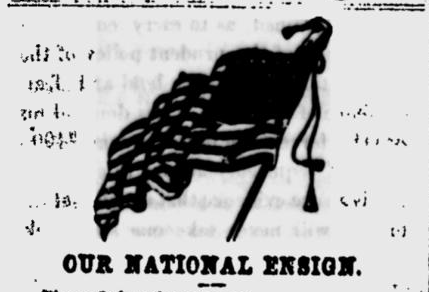 Samuel J. Vandersloot, a 25 year old Gettysburg attorney, enlisted as a private the 2nd Pennsylvania Infantry Regiment on April 20th, 1861. Less than a month after he and his comrades published their paper, on the 26th of July Vandersloot was mustered from service at Harrisburg. Five days before, the Army of Northeastern Virginia had its nose bloodied at Manassas. Picnickers, keen on sightseeing and eager to witness the one great battle of the war became entangled on the roads among the retreating Federal forces. Civilian and soldier alike became prey to the advancing rebel forces, some captured and sent South to prison at Richmond. The nation realized this might be a longer war than 90 days. Vandersloot, for his part, escaped his short taste of soldier life unscathed. The unit never saw substantial action before being mustered out. 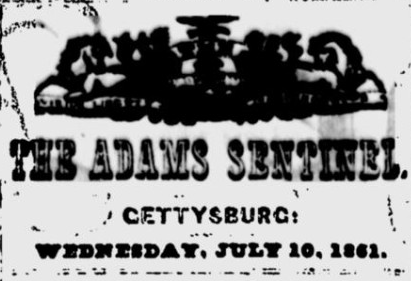 In Gettysburg on July 4th, 1861, bells rang and cannons fired to celebrate the birth of that nation a scant four score and five years before. After scenes of soldiers marching through Gettysburg's streets, uniforms sharp and crisp, the town processed in hacks and carriages to Spangler's Spring for a picnic, and, "an excellent one it was." One hundred and sixty people, the Sentinel reported, lounged on the meadow and in the shade of the trees on a quite and joyous summer holiday. War was as far as it could be from bucolic Gettysburg.